Today's post will have a few ideas for you, but I'm hoping that you dear readers will be able to add to my list! I love having my kids home for Spring Break, but (let's be real here) it can be a long week when they start getting bored. 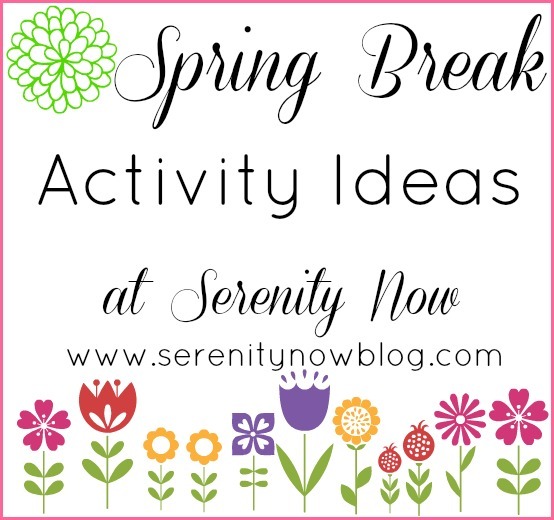 I wanted to share a few Spring Break Activities for Kids that you can do at home, and a few that you can hit head out on the town for. Driveways are great for this. The elementary school down the street also has a huge blacktop area that makes a nice blank canvas. It's not too late to pick up some for Easter baskets. Target had a cute Barbie paper doll set in the coloring book aisle. Bring those Audio Books inside! If you don't have a CD player, pick up a cheap one at a big box retailer. 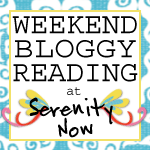 I have a great list of audio books for kids here on the blog. This could make for a quiet half hour or so for you to get things done while they listen and use their imaginations. Stock up on paper pads, paints, crayons, markers, and Play Doh. Have the kids create some masterpieces for grandparents, teachers, or friends. Weather permitting, let 'em run around the backyard with a tea set or pirate sword. Get their imaginations working. 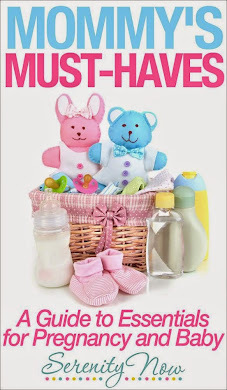 Outdoor toys like plastic golf or horseshoe sets, jump ropes, hula hoops, and bubbles are also great Easter basket gifts. My girls love their LeapPad2. If I don't want them just vegging out in front of the TV, or if the weather is awful, I let them choose some learning games to play for a specified period of time. Invite some friends over for a Fancy Nancy or Magic Treehouse party. 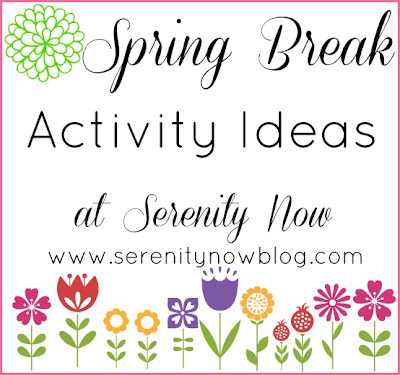 Put a craft together that fits the theme, and spring for some juice boxes and crackers. Have a regular old playdate! The days my first grader has a friend over are often the days I am able to get more done. The girls occupy themselves and everyone's happy. We also love switching things up and heading over to play at someone else's house for the morning. My friend and I get to chat and catch up and the kids play with friends in the basement. Get started on that garden that you've been talking about for months. Kids love to dig and help pick out plants and flowers. We're planning a day to visit our favorite American Girl Store in Washington DC next week. The girls and their friends will get to browse for awhile and we'll have lunch somewhere in the mall. Lots of libraries and bookstores offer special storytimes and/or fun activities. Our library sometimes shows short cartoons or movies that are book-related. Have a local park or playground? Pack a picnic lunch or snack, bring a book, and let the kids run wild while you relax for an hour or two. Visit a children's museum or history/science museum. We're blessed to live close enough to DC to be able to visit the zoo or museums, but many areas offer affordable options for little ones who love to learn. See if your local craft store is offering any free kids' demos or children's craft sessions for the week. Our area has several places with indoor bouncy houses and play areas. It can be pricey, but think of the wonderfully exhausted kids you'll bring home. Okay, it's your turn! Please do share your own ideas in the comments.